When you say 'yes' to Payplus then you will be allocated your named payroll team contact who will run your payroll. You will be given a direct dial phone number to your payroll bureau team contact and emails will be answered within 24 hours. Our payroll processing procedures include checking of the results by you to ensure a problem-free payroll run. As a Bacs approved bureau we can pay salaries, HMRC, pensions and 3rd party payments on your behalf. The Payplus payroll outsourcing includes full Pensions Automatic Enrolment compliance if that is what you require. Data security is at the top of our agenda and we provide a secure portal, encrypted emails, and an online payroll dashboard. Staying up to date with ever-changing payroll legislation can be a real challenge, but you don’t have to deal with it all yourself. When you choose to outsource your payroll to Payplus, you can rest assured that your payroll is in safe hands. With over 40 years of experience, we pride ourselves on the personal service provided by our skilful team. Irrespective of the size of your business, when you choose Payplus you know you’ll be working with someone who understands your business and speaks your language. On Time. Every Time. No Problem. I would absolutely recommend them. They've been very efficient, very effective. Payroll should be something you don't need to think about. You just need your staff to be paid the right amount every time. We have designed our processes to guarantee that - or you get more than your money back. 1. We are committed to providing you with first-class payroll services– ON TIME, EVERY TIME, NO PROBLEM. 2. You don't pay any set-up fees until your first payroll has been successfully run. b) Provide the necessary data to a new payroll provider of your choice free of charge. 4. In addition, if one of your employees should suffer loss from an error made by us then we will REIMBURSE THEIR COSTS, send them a personal apology and explain that it was our mistake, not yours. 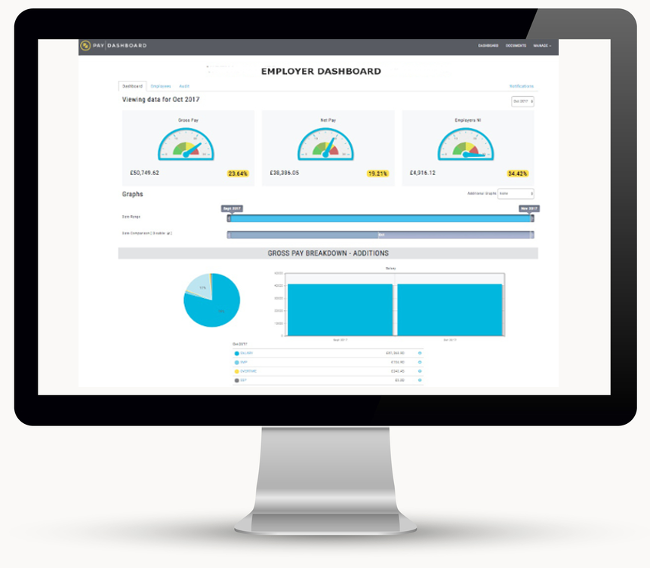 You will have access to online Employer and Employee dashboards, viewable via a browser on PC, tablet or mobile. Your employees can see their pay data, payslips and P60's, while you can see all of that and the overall payroll data and the downloadable payroll reports. Although you can choose to outsource only parts of your payroll, our Managed Payroll Service clients tell us that outsourcing their entire payroll system gives them huge peace of mind. When you choose our Fully Managed Payroll Service, you can forget about staying up to date with Real Time Information, PAYE rules and HMRC legislation in the knowledge that you have an expert looking after all that for you. By choosing this option, you have a team on hand that speaks your language and makes all your weekly and monthly returns on your behalf. Working this way is the very best way to rid yourself of your payroll headaches and free yourself up to do what you do best – run your business. You can find out more about the Payplus Fully Managed Payroll Service here. Are you an overseas business? If you have an overseas company with a UK payroll requirement we can look after that for you. Payplus will provide you with assistance regarding UK laws and regulations as well as payment facilities. When you choose to work with Payplus, you can rest assured that you are working within the UK payroll regulations. Irrespective of whether you are a service provider, manufacturer or simply have UK representation, we make your UK payroll easy and stress-free. All our teams are based in the UK and provide you with exceptional, personal payroll services. In addition, we can assist you with non-payroll financial matters, such as dealing with contracts and other HR matters, accounts and tax requirements and determining how your UK operation fits within UK legislation. Get started with Payplus Payroll Services Today! Do you process payroll for sectors with specific needs? While many payrolls are similar, there are certain sectors that have very specific rules. Such sectors require specialist attention. At Payplus we have teams that deal specifically with Recruitment Agencies, charities and Schools and Academies. If your business is in one of these specialist sectors, why not get in touch to see what we can do to help? Are you a Bacs Approved Bureau? Payplus is authorised to make Bacs payments on behalf of our payroll clients. What this means is that you can ask us to make payments directly from your bank account to pay your employees, HMRC and other third parties. This highly secure way of working is regulated by Bacs through regular audits and stringent regulatory requirements. We automate this as part of the payroll processing and it means that once your payroll is authorised you don’t need to remember to make the payments, we will make them for you. When you choose to work this way, you can have complete confidence that the payments you are due to make will be made on time and correctly – every time. Do you run payrolls for accountants? If you’re an accountant and neither have the desire nor expertise to run payrolls in-house, Payplus is the perfect solution. Not only can we provide top quality services for you, but we can also provide payroll services for your clients. Either by working in conjunction with you or with your clients direct, we will provide exactly the sort of payroll service you expect and deserve. We know and understand the importance of your client relationship and can enhance that by providing the payroll service your clients require in line with your needs and theirs. The great thing about outsourcing your clients’ payroll to Payplus is that you can free yourself up to do the work you’re best at without getting bogged down in the likes of Pensions Auto Enrolment, PAYE and HMRC queries – all in the knowledge that your clients are getting an exceptional payroll service. Do you deal with Pensions Automatic Enrolment? Provide you with an appropriate, working understanding of what’s required. Assist in the selection of the right pension scheme for your needs. Make your employees’ Pensions Auto Enrolment calculations and deductions. Pay over contributions to pensions providers and provide them with the necessary reports. Deal with opt-ins and opt-outs. Issue the Declaration of Compliance. At Payplus, we know that payroll is only one part of your business administration and it’s for this reason that we work with an HR services partner to relieve you of even more legislative and regulatory responsibilities. Human Resources can be a real headache for businesses big and small. As with payroll, it is heavily laden with paperwork, systems and structure, meaning it’s not always cost effective for companies to retain their HR in-house. At Payplus we provide you with access to efficient, friendly and cost effective HR solutions to make sure you have all the manuals and documentation you need in place. You will also be provided with an HR advice service and telephone support, so you need never feel alone. The proof of our capability is the fact that our clients grow and stay with us year on year. Great prices – The payroll services we provide are less costly than very large payroll companies and other payroll providers. Transparency – You know the price you need to pay and you won’t ever pay more. There are no hidden extras. Service guarantees – Our service is guaranteed, so you can work in complete peace of mind. Freedom and flexibility – We are so confident that you’ll be happy with our service we don’t feel the need to lock you in. When you work with us, you can leave anytime you want to – but if you’re like most of our clients, you will choose to stay.